Decomposing total costs as fixed costs plus variable costs. Quantity of output is measured on the horizontal axis. 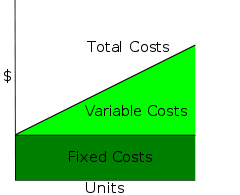 Along with variable costs, fixed costs make up one of the two components of total cost: total cost is equal to fixed costs plus variable costs. In economics, fixed costs, indirect costs or overheads are business expenses that are not dependent on the level of goods or services produced by the business. They tend to be time-related, such as interest or rents being paid per month, and are often referred to as overhead costs. This is in contrast to variable costs, which are volume-related (and are paid per quantity produced) and unknown at the beginning of the accounting year. For a simple example, such as a bakery, the monthly rent for the baking facilities, and the monthly payments for the security system and basic phone line are fixed costs, as they do not change according to how much bread the bakery produces and sells. On the other hand, the wage costs of the bakery are variable, as the bakery will have to hire more workers if the production of bread increases. Economists reckon fixed cost as a entry barrier for new entrepreneurs. In management accounting, fixed costs are defined as expenses that do not change as a function of the activity of a business, within the relevant period. For example, a retailer must pay rent and utility bills irrespective of sales. In marketing, it is necessary to know how costs divide between variable and fixed costs. This distinction is crucial in forecasting the earnings generated by various changes in unit sales and thus the financial impact of proposed marketing campaigns. In a survey of nearly 200 senior marketing managers, 60 percent responded that they found the "variable and fixed costs" metric very useful. Fixed costs are not permanently fixed; they will change over time, but are fixed, by contractual obligation, in relation to the quantity of production for the relevant period. For example, a company may have unexpected and unpredictable expenses unrelated to production, such as warehouse costs and the like that are fixed only over the time period of the lease. By definition, there are no fixed costs in the long run, because the long run is a sufficient period of time for all short-run fixed inputs to become variable. Investments in facilities, equipment, and the basic organization that cannot be significantly reduced in a short period of time are referred to as committed fixed costs. Discretionary fixed costs usually arise from annual decisions by management to spend on certain fixed cost items. Examples of discretionary costs are advertising, insurance premia, machine maintenance, and research & development expenditures. Discretionary fixed costs can be expensive. In business planning and management accounting, usage of the terms fixed costs, variable costs and others will often differ from usage in economics, and may depend on the context. Some cost accounting practices such as activity-based costing will allocate fixed costs to business activities for profitability measures. This can simplify decision-making, but can be confusing and controversial. In accounting terminology, fixed costs will broadly include almost all costs (expenses) which are not included in cost of goods sold, and variable costs are those captured in costs of goods sold under the variable costing method. Under full (absorption) costing fixed costs will be included in both the cost of goods sold and in the operating expenses. The implicit assumption required to make the equivalence between the accounting and economics terminology is that the accounting period is equal to the period in which fixed costs do not vary in relation to production. In practice, this equivalence does not always hold, and depending on the period under consideration by management, some overhead expenses (e.g., sales, general and administrative expenses) can be adjusted by management, and the specific allocation of each expense to each category will be decided under cost accounting. ^ Farris, Paul W.; Neil T. Bendle; Phillip E. Pfeifer; David J. Reibstein (2010). Marketing Metrics: The Definitive Guide to Measuring Marketing Performance. Upper Saddle River, New Jersey: Pearson Education, Inc. ISBN 0-13-705829-2. The content used from this source has been licensed under CC-By-SA and GFDL and may be used verbatim. The Marketing Accountability Standards Board (MASB) endorses the definitions, purposes, and constructs of classes of measures that appear in Marketing Metrics as part of its ongoing Common Language in Marketing Project. ^ McEachern, William (2012). Economics: A Contemporary Introduction. Mason, Ohio: South-Western Cengage Learning. p. 158. ISBN 0-538-45374-5. ^ Schwartz, Robert (2010). Micro Markets: A Market Structure Approach to Microeconomic Analysis. Hoboken, New Jersey: John Wiley & Sons, 2010. p. 202. ISBN 0-470-44765-6. ^ Bragg, Steven (3 November 2011). "What is a discretionary cost?". Accounting Tools. Retrieved 10 March 2012. ^ Dr Alex, Suleman. "A controversial-issues approach to enhance management accounting education". Journal of Accounting Education. 1994: 59–75. ^ Ali, H.F. "A multicontribution activity-based income statement". Journal of Cost Management. 1994 (Fall): 45–54.